Visiting Mom, dropping off daughter and visiting friends. The circuit is becoming familiar now, and so the food is improving with each visit. First, Schenectady. I return again and again to Cappiello's. Their specialty is mozzarella, fresh, plain and braided with flavor. My favorite now is the smoked braid. Worth checking out. They also have a full deli, including house made sausage (very good, sweet and hot) of the dried cured variety. Various pasta dishes made and frozen. Bread that I think they make on the premises. Sandwiches - italian subs and smoked turkey with their own Mozzarella. Strangely disappointing, given the impeccable ingredients. The bread is a small sub roll, with soft crust. Inside is the meat and cheese, plus some sun dried tomato and vinegary peppers. No dressing at all, and they only offer mustard (!) on the side. Next time I will bring some italian dressing and I bet it will be great. Last but not least there is the pizza (large, bready sicilian type, full of tomato, almost a salad on bread) and stuffed breads. The daughter and I both loved the plain pizza. I enjoyed the eggplant stuffed loaf, a chewy shell of crust and bread full of flavorful and garlicky eggplant. I spent 5 days in Schenectady and went to Cappiellos no less than 5 or 6 times. Almost next door is Nick's diner, which I almost missed. Nick's is notable for its demonic statuary. 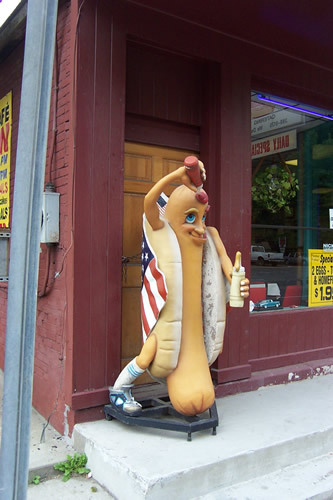 About 4 feet tall, each, there are a hot dog and an order of fries on both sides of the entrance, graced with truly crazed faces. I will see about getting my pix posted, rather than offering further description. On my last day I arose too late to have breakfast at the hotel and so discovered the glory that is Nick's. A great old grill, packed on a Sunday morning with Nick working the crowd, and he knew half of them. Reminded me of some parts of Pittsburgh, as it happens. Just had pancakes and bacon, but the offerings were impressive, and I should have gone more. Both are on Broadway, just north of the I 890 exit (there also is a fabulous old coke sign painted on a building just north of them). If you continue north on Broadway, you will encounter the Pro Wrestling Hall of Fame, which never seemed to be open, and then State Street and downtown Schenectady, which shows so clearly how getting more than your fair share of state and federal funds still will not reverse a century-old slide, but I digress. In the area, I also had some other decent meals, though my recommendation is to stick with those two as much as possible. Scotty's (Union St.) and Da Vinci (State St) in Schenectady offer decent old school Italian. Both were okay, not fabulous. Marino's (State St) offers cheap Italian, a step below the other two, but it is more informal and a Red Sox bar of sorts, so it has its charm. i suspect their pizza is better than the pasta and eggplant we tried. Da Vinci was the best for me, but each has its pros and cons. Further down route 5 (which is State Street in Schenectady, but changes as it wends through Colonie and Albany) is You Love New York Pizza, which sells very respectable slices. A little thinner and crispier than true NYC Pizza, IMO, but tasty and they had ay least 7 or 8 different pizzas by the slice. 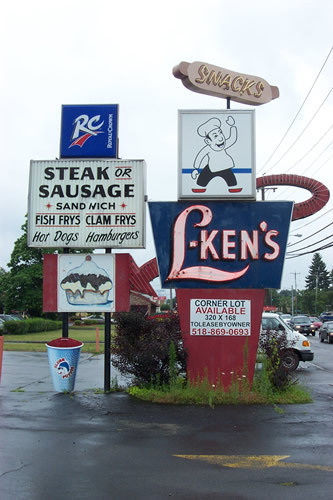 Lastly, there is L'Ken's drive in, which was pretty darned good. 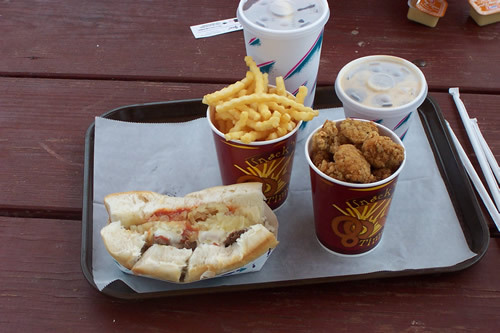 A high quality, real meat, peppery coating chicken nugget was good, and the steak sandwich was even better. Tender little steak bits and nice cheesiness. It came with onions and sauce which I would skip next time. Canned onions, it seemed, and bland barbecue sauce, but beneath that as a good sandwich. Lastly, let me point out that my research on Albany with this group and elsewhere has turned up so little information that I began to wonder. But now I know, there are good places. Next: A couple more places in Albany, and then Maine and the cheeses of Vermont, plus those pictures, I hope. New England updates to follow. Part 3: a little more Albany area. I had a light summer meal - rebosos con mole, which is fried plantains in a tortilla, covered with a nice rich mole. Delectable. And then a red posole. Also very nice. Did not get a chance to try my companion's meals, but it all looked quite well done and the menu shows promise. Moving on, in Portland, Maine, we dined at 555, a pleasant upscale joint. The appetizers and wine were quite good. Carpaccio done right. Flatbread with potatos and three cheeses would make a hearty meal on its own. The salad of field greens and strawberries with a strawberry vinaigrette was delightful. My main course of Pan Seared Halibut with bacon, pearl coucous, wilted baby lettuce and mussels (ordered at the suggestion of our server) was not so good. Besides the silly profusion of ingredients, or perhaps inevitably because of this, the dish was not well-executed with the sear of the halibut not providing the pleasant crust I expected, and the flavors not balancing well. The bacon was either too fragrant or too much was used, as it was really the only flavor I could distinguish. I had 2 wines by the glass - a 2000 Ahlgren Semillon that was oaky, rich and deep. Don't look for it as the label was handwritten and numbered, so I imagine you can't find it. But I will check out more Ahlgren wines. And with my cheese course (Willow Hill VT Brebis, and Smiling Acres ME cheddar, okay but nothing special) I had Blacksmith's Blueberry Sparkler (a wine from Maine), a grape/blueberry blend that went quite well with the cheese. I did find Blacksmith's in a store the next day and plan to see if I can get more than what I brought back. As an aperitif, or cheese accompaniment it works. They also might a simple, pleasant, off-dry still white from Vidal Blanc. 555 served an excellent bread, a rustic, lightly sour sourdough from 150-ate bakery in Cape Elizabeth, which the owner of 555 told me also has a cafe. We really wanted to go and visit, but time did not allow. Last edited by dicksond on August 3rd, 2004, 8:24 am, edited 1 time in total. Finished the trip visitng some friends near Northfield, Vt. We combined cheese searches with mountain climbs. Neighborly Farms - Nice people, specializing in organic cheddar. They have not been in business long (a year or so, I think), so all the cheeses were young and simple. Three Shepherds - this place is sort of famous, because the USDA seized and killed all their sheep a few years ago because of fear of Mad Cow contamination. A link is here http://www.vtcheese.com/vtcheese/news/sheep72100.htm, but there is a lot on this on the web. The irony is that the father was a researcher on Mad Cow in England before moving to Vermont, which is why he fought the USDA. The Three Shepherds are his kids, the youngest of which is the primary cheesemaker, so the whole things is a great story. They only sell the cheese in the cooperative store in Warren, Vt, and seem more focused on being an incubator for cheesemakers. Their cheeses are good, and they make a wide range of fresh and aged, sheep and cow's milk. We sampled the King Louis (rich, creamy, strong flavor and a very salty rind), Brabander (firm, dry and aged, sort of like an aged gouda) and Aurora (similar to the Brabander but with a washed rind and a slightly stronger flavor). We also bought a number of other cheeses. The high points were a Toma from Westminster - a soft, creamy and slightly stinky cheese, and Grafton Cheddar, which is failry well known, but I had not sampled it before. An excellent cheddar, better than anything I have had in the US before. And that was it for the trip. Great posts and especially good pictures. 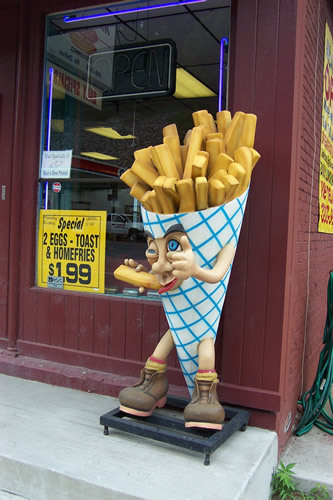 I expect the demonic cone of fries to haunt my nightmares for weeks. One more that I almost forgot. Another great destination is Barre, Vermont, just 15 minutes east of Montpelier. It is an old quarry town, and also known as the birthplace of American socialism, in some circles. The granite and tradition of stone cutting has resulted in an amazing cemetary where talented stone cutters have clearly competed to make the most amazing tomb/headstones. I will see if I can post a couple of pics a little later to give a flavor, rather than trying to convey this in words. Trust me, it is impressive. The whole place is beautifuly packaged with photos and quotes from many of the food producers on the menus, place mats, and all around. Each dish comes with a pedigree stating which local producer supplied the raw materials. The owners seem to be setting up their own supply chain, including slaughtering livestock, curing bacon, and trucks to move everything. As I understand it, the place is doing a good business (it was busy, but not full, late on a Saturday morning), and they wish to open some other locations. But, as has been discussed elsewhere regarding supermarkets, there are major logistical challenges in sourcing food from small, local, producers and they need to work through scaling up to do this. And the food, you may ask? Hey, it's a diner and we had breakfast, what could be bad? Whole wheat pancakes were good, and the Maple Syrup was quite good, though they only give you a small amount (not enough for my pancakes) and you have to pay more to get more, which I should have done but did not. The local bacon was not as salty and rich as I would have liked - probably not the level of nitrates I am used to. The specials leaned towards large, multi-ingredient, global omelettes, and the one I sampled (feta, spinach, tomatos, and a few other things) was pretty good. Prices seemed quite reasonable for what one gets. Good meal, pleasant place, and worth visiting and supporting if you are in the area. And that cemetary is amazing. En route, stopped at Four Brothers in Great Barrington. Greek boys running an Italian joint (reminded me of the good old days in Chicago when every restaurant was owned by a Greek). Good grinder, decent pizza, interesting menu. Plus, lots of press on Nixon eating there when he was President. I would go back. Stayed at a little Inn, the Stockade Inn, in Schenectady which has been adopted by Union College, and is being fixed up. It was formerly a private club, the Mohawk. The stockade is a lovely old neighborhood. The restaurant is a fine dining destination in Schenectady, I guess. In general, the meal was overwrought, and over seasoned. My special was seared scallops in basil cream sauce over rigatoni. Sounds like a nice dish, right? Sure, but they also added crumbled sweet italian sausage, plum tomatos, and pancetta (large gobs of pancetta). I did not get to the bottom of this dish, but I believe there was also a kitchen sink in there and two loaves of bread. Lots of garlic, too, which is not entirely bad, but is definitely symptomatic. Some other dishes were okay, and prices were fine, but someone needs to restrain the chef. If you go, order a grilled steak, creamed spinach and mashed potatos, 'cause I have warned you. Went back to Nick's for breakfast the next morning, and was quite happy with my eggs over homemade sausage bread, excellent home fries and weak coffee. Nick's is an all star diner, and between Nick's and Capiello's up the street (see posts above) that block of Broadway remains the dining destination in Schenectady, for my money. And darned good food for any place. I have dined at 555 before and enjoyed my meal; I'm sorry yours was less pleasing. Though it's been much talked about, I really like Fore Street. Great open kitchen, and they have an open pit where they can cook your choice of fish. Meat dishes abound as well. Had occasion to be in Albany and Schenectady last weekend and returned to El Mariachi. Once again had the rebosos and a chicken soup whose name escapes me - large chunks of meat with vegies in a tomato/chile broth. It was a regional dish of some sort. The food was a touch disappointing. The rebosos were made with bananas this time, not plantains, making the whole thing a bit too sweet for a main course, so I ate it as a dessert. The chicken was a bit overdone, and they were stingy with the broth. I am going to blame this on it being a Monday night. The menu continues to have a fascinating range of obscure (to me anyway) regional dishes that I just have not seen anywhere else. If I lived there, I would probably work my way through the whole thing. On the way back to the hotel, I stopped at Grandma's Restaurant and Pies on a whim. Excellent pie, possibly the best I have had besides Cathy's. Light, flaky crust, good quality fillings, not too sweet. I had a peach praline pie, which gets points for being good, and creative, and got strawberrry rhubarb for Mom, which she shared with me. Good enough that I will probably go back next time I am in town. I might even have a meal though a brief review in the Albany Times Union did say what I would have guessed - "Big, luscious pies that eclipse anything else this place is known for..." Unfortunately, Grandma's has a gift shop, too, so the kitsch quotient can be high. Grabbed a quick breakfast at Nick's the next morning. Still the same. Did not have the time, or the stomach, for Cappiello's this trip, but I gazed at it longingly while driving past on my way to Nick's. Downtown Schenectady seems to be a in real upswing right now with both the city and developers pumping in a fair amount of money.